Today is the one year anniversary of the hurricane that devastated New Orleans, southern Mississippi, and other parts of the Gulf Coast. I heard on the news this morning that 70,000 New Orleans residents have set up permanent residence in my north Texas area. I can’t imagine what a traumatic experience all this upheaval has been for them. I’ve been to New Orleans myself many times (since it’s only an 8 hour drive away) and have returned twice since Katrina hit there. The devastation—even a year later—was incredible. Many ninth ward neighborhoods are still a stroganoff of houses, cars, trees, and debris. People’s HOMES. And the city itself is still operating at half capacity. A vibrant, fun-loving city like New Orleans brought to its knees—it’s ankles, even. So sad. How do we share these experiences with children? How do we capture what we are all feeling? One poem by Janet Wong comes pretty close to conveying the differing emotions and perspectives that have bubbled to the surface. Janet was kind enough to write this as a poem for my book, POETRY ALOUD HERE! SHARING POETRY WITH CHILDREN IN THE LIBRARY (ALA, 2006) and it’s featured there alongside a moving and inspiring essay that she wrote. Meanwhile, as a tribute to the children of Katrina, here is the poem itself. for children hurt by the hurricane. Teacher says, “Handful of dimes is fine. Momma says, “Those people should have known. Poppa says, “Look how those people stole. I saw the pictures, too, myself. People with nothing, no cars, for sure. Swollen old ladies could barely walk. but also daddies grabbing bread. So many bodies floating, dead. up past neck, past mouth, past eyes. How long did they wait for help? I put today in the coin drive jar. I saw the pictures for myself. Bush, Timothy. 2000. Ferocious Girls, Steamroller Boys, and Other Poems in Between. New York: Orchard Books. Glaser, Isabel Joshlin, comp. 1995. Dreams of Glory: Poems Starring Girls. New York: Atheneum. Paul, A. W. 1999. All by Herself: 14 Girls Who Made a Difference: Poems. San Diego, CA: Browndeer/Harcourt Brace. Philip, Neil, comp. 2000. It’s a Woman’s World: A Century of Women’s Voices in Poetry. New York: Dutton. Here’s a tidbit that I picked up from a teacher that I think is a wonderful way to promote poetry. Post poems in places children stand, stare, and wait. In her classroom she posted a poem on the wall above the pencil sharpener. Whenever kids sharpened their pencils, they stood idly and read a poem. Ingenious! (Are there still pencil sharpeners on classroom walls?!) I started to think of other places throughout the school where children stand and have a moment to read a poem. Can you think of other places? This kind of incidental sharing of poetry is a lovely, gentle way of making poems a part of children’s everyday lives. In addition, once this practice is established, kids could take over choosing favorite poems to post on a rotating basis. They could copy their favorites (for handwriting practice), create an original illustration to accompany the poem (for an art activity), or even share their own original poems. They might even have creative ideas for WHERE to post poems. 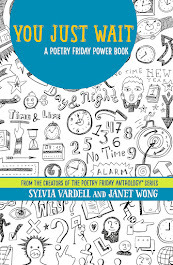 And when it’s time to take down a poem and replace it with a new one, the “old” poems can be compiled in a class anthology to revisit in book form. Surrounding children with poetry in these incidental ways shows children we value poetry as an everyday part of life. We know children are learning from us and from their surroundings every minute. Why not maximize their absorption with their environment by infusing poetry in subtle, yet powerful ways? Grandma made before she died. you couldn’t pay me to eat. slightly deformed, no longer fluffy. Grandpa took me deep-sea fishing. 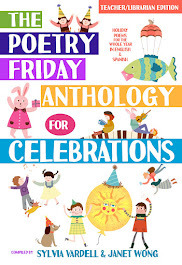 Published by Wordsong (2006), the poetry imprint of Boyds Mills Press, this collection is a reassuring voice for children who are dealing with one of life’s most challenging transitions. P.S. Ralph Fletcher is also the author of many helpful books for adults who work with children on writing, including A WRITER'S NOTEBOOK, CRAFT LESSONS, POETRY MATTERS, and many more. 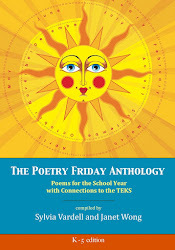 The topic of the teacher has also been the focus of many poems. Douglas Florian’s “My Monster” poem from BING BANG BOING is one of my favorite “teacher” poems, one that requires a sense of humor on the part of teachers. Another poem, “But I Have Mr. Cratzbarg“ by Kalli Dakos found in DON'T READ THIS BOOK, WHATEVER YOU DO! is a lovely tribute to that special teacher. I’ve used the poem below many times at teacher workshops, inviting the participants to join in on the line "Mrs. Fuller does.” It’s from a small collection of wry poems from the teacher’s point of view entitled HIDE YOUR EX-LAX UNDER THE WHEATIES by Cheryl Miller Thurston (Cottonwood Press, CO). and her cabinets are dusted. and her shades are adjusted. a pass that she issues. come out right to the penny. or forgets to take roll. is complete for the year. or lunch never tire her. in things that don't fit. run to "Quiet" and "Sit." OK, so it’s a little bit corny, but I agree with the focus on children over protocol, particularly in this test-driven age. 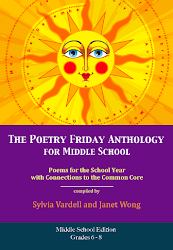 Teachers who put children first are worth celebrating in poetry! Here in Texas, most public schools are starting again this week. Although temperatures still soar above 100, kids are back at their desks starting a new year. To commemorate this moment, here’s one of my favorite back-to-school poems. This poem lends itself to several different read aloud techniques. Kids can just join in on the repeated word “close” or alternate reading every other line in two groups, with everyone joining in on the final line. Or individual volunteers can read individual lines solo, with everyone joining in on the final line for added effect. Dakos, Kalli. (1990). If you're not here, please raise your hand; Poems about school. New York: Simon and Schuster (and others by Dakos). Harrison, David L. (1993). Somebody catch my homework. Honesdale, PA: Wordsong Boyds Mills Press. Hopkins, Lee Bennett. Editor. (1996). School supplies: A book of poems. Simon and Schuster. Kennedy, Dorothy M. Editor. (1993). I thought I'd take my rat to school: Poems for September to June. New York: Little Brown and Company. Paraskevas, Betty. (1995). Gracie Graves and the kids from Room 402. San Diego, CA: Harcourt Brace and Company. Shields, Carol Diggory. (1995). Lunch money and other poems about school. New York: Dutton (and others by Shields). There’s nothing quite like seeing the rough drafts of a published poem. The finished product we read in a book seems so perfect that it’s hard to imagine the writer ever struggling with ehttp://www.blogger.com/img/gl.link.gifvery word and phrase. This is particularly true for children who think adults never make mistakes in their writing. Showing them drafts of writing (including your own) is a very eye-opening experience for them. Showing them drafts of a published poem can open up a whole world. 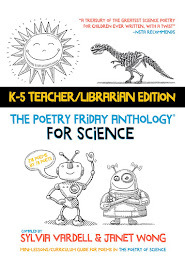 The Children’s Literature Research Collections held at the Kerlan Collection of the University of Minnesota offer a unique resource for sharing poetry with children: a portfolio of materials donated by NCTE Poetry Award winner, Barbara Esbensen. The Barbara Esbensen Poetry Portfolio is multi-media learning tool that uses the work of Barbara Esbensen to highlight her versatility as a writer, poet and storyteller. The kit is appropriate for grades 2 through 8 and includes lessons, biographical information, supporting documents, and overhead transparencies of manuscript pages and galleys of Esbensen’s writing. This can be invaluable for helping children understand the process of writing and publishing poetry. Aspiring writers, in particular, will find this “behind-the-scenes” view fascinating. My son leaves for college this week and we are excited for him as he begins this new adventure, but I sure am going to miss him, too. In honor of this event in our family, here’s a poem written by a teenage boy that touches my mother’s heart. Aguado, Bill. 2003. PAINT ME LIKE I AM: TEEN POEMS FROM WRITERSCORPS. Harper. Francis, Lee. 1999. WHEN THE RAIN SINGS: POEMS BY YOUNG NATIVE AMERICANS. Simon & Schuster. Franco, Betsy. 2001. THINGS I HAVE TO TELL YOU: POEMS AND WRITING BY TEENAGE GIRLS. Candlewick. Franco, Betsy. 2001. YOU HEAR ME? : POEMS AND WRITING BY TEENAGE BOYS. Candlewick. Lyne, Sanford. 1996. TEN SECOND RAIN SHOWERS; POEMS BY YOUNG PEOPLE. Simon & Schuster. Lyne, Sanford. 2004. SOFT HAY WILL CATCH YOU: POEMS BY YOUNG PEOPLE. Simon & Schuster. Nye, Naomi Shihab. 2000. SALTING THE OCEAN; 100 POEMS BY YOUNG POETS. Greenwillow. I heard in the news this week that it is so hot this summer a woman in New Hampshire actually baked cookies on the dashboard of her car! She placed two trays of cookie dough on the dashboard of her car while the outside temperature was in the high 90’s, but the temperature inside the car was around 200 degrees. Voila! Fresh baked cookies. She said that an extra benefit was how wonderful her car smelled afterward. I was reminded of a fun poem I have often used with kids entitled, "Nutty Chocolate Cookies” by Pauline Watson. This is an actual recipe turned into a poem that has a strong rhythm, rhyme, and easy to follow sequence. Kids love to join in on the read aloud. In fact, I have found that you can even SING the poem to the tune of the old folk song, “She’ll be comin’ ‘round the mountain,” if you’re feeling really adventurous. (More on singing poems another time!) 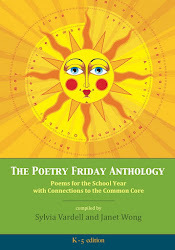 You’ll find the recipe-poem “Nutty Chocolate Cookies” in the wonderful resource book, THE POETRY BREAK, by Caroline Feller Bauer. 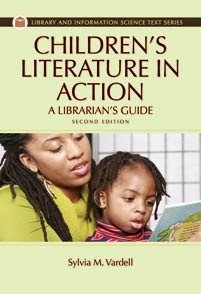 I highly recommend her book for a multitude of creative ways to present poems to children. So… find the poem, gather the ingredients, sing the poem, mix the cookies, and then bake them on the dashboard of your car! Eat the cookies and enjoy the poem all over again. What a fun summer memory that would be for kids. Are you familiar with the Poetry Foundation? If you know poetry for adults, I’m sure you know of their work. They publish POETRY magazine and are committed to fostering a “vigorous presence for poetry in our culture.” Don’t you love that mission? You may have heard of the enormous Lilly grant that morphed the Modern Poetry Association, founded in 1941, into the Poetry Foundation of today. And their web site is a meaty resource of information. In particular, they are creating a lovely CHILDREN’S area that bridges classic and contemporary poetry for young people. 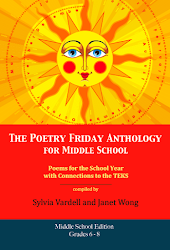 Currently, it includes a growing list of “Feature” articles on a variety of topics, a helpful “Essentials” poetry booklist, a regular “Book Pick” poetry book review, and a mini-archive of full text poems for children. This month’s “Book Pick” (by yours truly) features a lovely anthology by the new U.S. Poet Laureate, Donald Hall (also author of the Caldecott award book, OX CART MAN). It’s almost a history of poetry for children, with its chronological collection of American poems and art—but still very accessible for kids today. Check it out. Just for fun—here is a poem for a hot August day. Hopkins, Lee Bennett, comp. 1983. THE SKY IS FULL OF SONG. New York: Harper & Row. 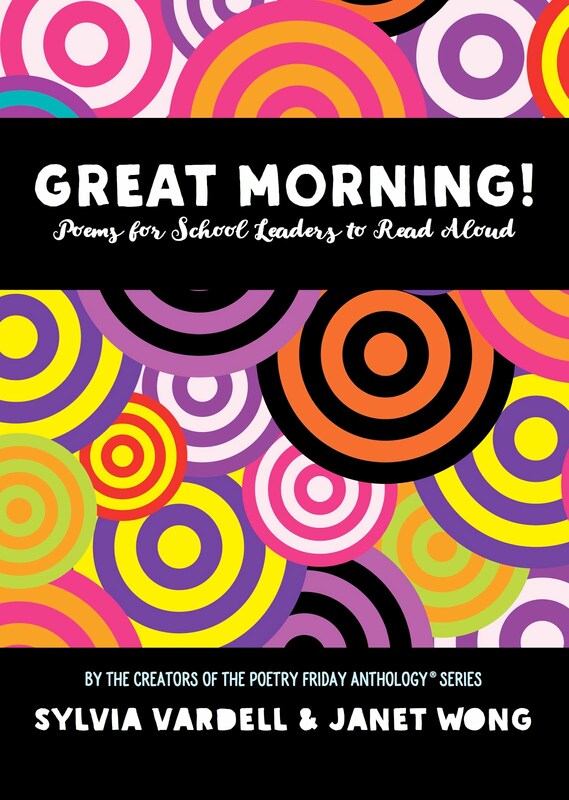 This poem lends itself to several different read aloud strategies. First, write the words “and sit” on four index cards numbering them from 1 to 4. Ask for volunteers in the audience, one per card. Then as you read the poem out loud, the four seated volunteers each read their part (“and sit”) right where they are seated, one after the other (1, 2, 3, 4). (Practice once with the four volunteers before reading it with the whole group, if needed.) Read it again and again with four different volunteers each time, if interest is strong. Next, incorporate motions or movement—sitting. Break the audience into four groups, invite them to stand as you read the poem, and then point to each group to sit as you read the phrase “and sit” each time. If you are feeling really brave, this poem can even be read in a round or canon. 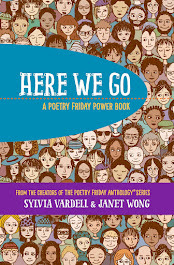 Divide the group in two, each group reads the whole poem, but the second group begins after the first group finishes the first line—much like singing “row, row, row, your boat” in a round. It takes some practice, so you may have to do this several times before everyone gets the hang of it, but it’s a lot of fun. You might even try incorporating the sitting action along with the group reading for lots of laughter! Although these are helpful guidelines for selecting poems, they are not absolutes. Children enjoy many forms of poetry, including free verse and haiku, for example, but generally when they have had some broader exposure to poetry. 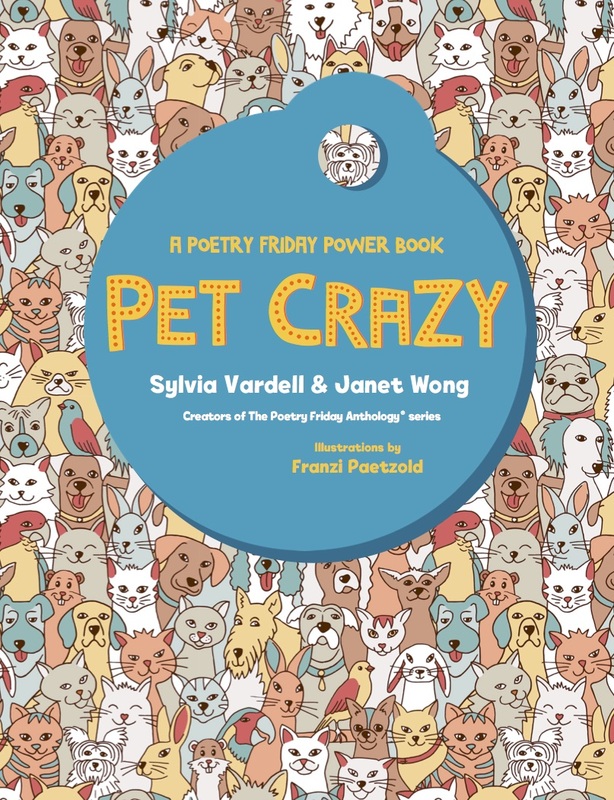 There is also no guarantee that every humorous, narrative poem about animals will be a hit with every group of children. Also most studies in the past are based on a limited exposure to poetry over a brief period of time (e.g., 50 poems read in 6 weeks time). If we share more poems more often, we will probably find more variety in their choices. As we get to know children, we can also seek out more variety to suit their different tastes and interests. So, what was the number one choice of children in these previous studies? It’s this poem by award winning poet and scholar John Ciardi. “Ha, ha,” he said, “I’ll try again. Looked like a manhole cover. The fork gave off a spark. I tried it with a hack-saw. I tried it with a torch. I’d sooner eat the plate! From YOU READ TO ME, I'LL READ TO YOU. Philadelphia: Lippincott. Reprinted. New York: HarperTrophy, 1987. It’s a terrific example of a humorous, narrative poem that tells a story (although with a bit of a stereotype of the roles of moms and dads perhaps more common when the poem was first published in 1962). It has a strong, regular rhythm that begs to be read aloud and word choice that is second to none. Many of Ciardi’s smart and wry poems have a similar tone, paving the way for Shel Silverstein and Jack Prelutsky who follow.